*Bonus* A free pdf download with 10 additional designs is yours with this Adult Coloring Book. Let your spirit guide you to color these detailed designs and find in them relaxation and peace. Coloring provides hours of stress relief and is a wonderful way to escape the rigors of everyday life. 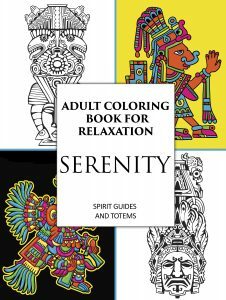 The Adult Coloring Book for Relaxation: Serenity: Spirit Guides and Totems, has 25 intricate designs together with inspirational quotes, notes on spirit guides and tips on how to color. Suitable for intermediate to expert colorists; images are printed on one side of the page.